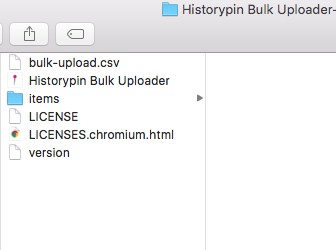 Our bulk uploader app allows you to use a batch process to create image, text & media pins using a comma-delimited text (CSV) file. As a project manager need to seed your collection with a batch of pins that participants can use as examples. 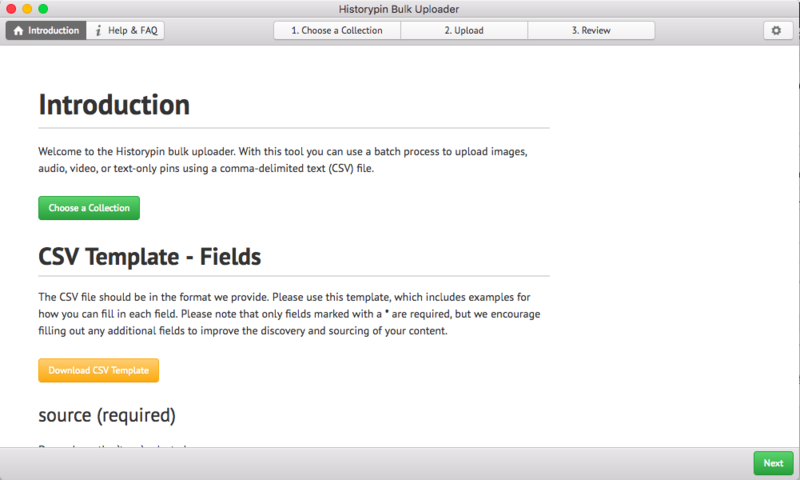 The first page of Historypin’s bulk uploader app. On this page you’ll find instructions for how to fill out each field of the CSV template. In the upper right-hand corner you’ll find our FAQs and help tips. Fill out the included CSV with data. Click through the steps in the uploader to input your API Keys, choose a collection to upload to, and add your CSV. The uploader will flag any CSV errors so you can make changes before completing the upload. While uploading your data, the uploader will list successful uploads (or unsuccessful ones) line by line until completion. View your results in your collection. Tip: You can gather a combination of these types on your CSV to upload multiple types at once. Add a folder called “items” containing your photo files to the same folder as your bulk upload csv (if applicable). All uploads must go into a collection. If you don’t have a particular collection in mind, you can create one with a draft title and always edit it later on Historypin. If you experience any errors while using the uploader, please email us at hello@historypin.org.